Having multiple accounts on a single website or service is quite common these days. Personally, I have 3 active, Outlook accounts, and that’s just one example. Now, the question is, how do we access and manage these multiple accounts simultaneously? Your answer would likely be to set up the different accounts on different browsers, or better still, use multiple user profiles to manage them. But the thing with this multi-browser/multi-profile approach is that you actually have to maintain multiple sets of almost identical preferences. And that includes all your preferred browser extensions, which you need to individually set up on multiple profiles. Sure, it’s a working approach, but it’s not really optimal when you consider the extensive setup process, you need to go through, just to be able to log in to a different account on the same website. SessionBox is a browser extension that aims to solve this issue. It sandboxes website sessions within the browser tab, allowing you to create multiple active sessions per site, on different tabs within the same window. This also implies that your browser preferences remain unaltered across all your sessions, since you’re accessing all of them on the same browser profile. Once the extension is installed, you can create multiple independent sessions, marked by distinct colors and names, each of which runs its own set of websites. The extension lets you organize and store these sessions, so that you can quickly restore them any time you need. You can sort different sessions by website, session or group, as per your convenience. Though you can make full use of the extension on a single instance of Chrome, without having to create a SessionBox account, doing so allows you to securely sync your sessions across multiple computers. However, in order to take advantage of multiple synced sessions, you need to pay a nominal subscription fee. The subscription costs $1.00 per month with auto renewal, and $1.50 per month without auto renewal, billed annually. Once subscribed, you can start a session on one browser and continue it on any other device logged in with your SessionBox account. SessionBox keeps your privacy intact by managing your session tabs, completely isolated from other Chrome (non-SessionBox) tabs. This ensures that other tabs and websites can’t monitor your activity. 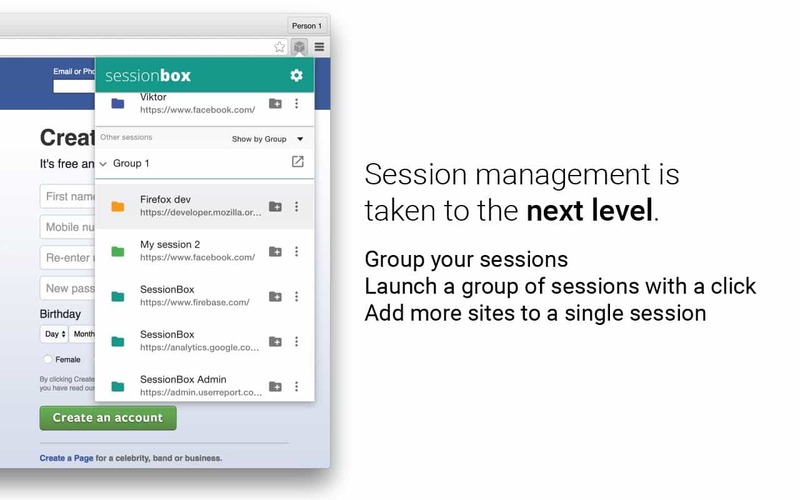 SessionBox is a free Chromium compatible extension, available on Chrome Web Store. MultiLogin is yet another lightweight Chrome extension that lets you create multiple sessions across different tabs in the same browser window. It’s pretty minimalistic when you consider its features. The extension gives you the option to begin a new browsing session each time you open a tab. You can either start a new session by clicking on the extension from the top right corner, or right-clicking on a web URL and choosing the “Open Link in New Identity” option. MultiLogin is a free Chrome extension, available for download from the Chrome Web Store. The above extensions work with the native Chrome Browser to give you a multi-session experience. If, however, you’re looking for a dedicated browser for the same purpose, you can check out Insomniac browser. If you know of any other solutions for creating and managing multiple sessions in the same browser window, tell us about it in the comments below.